COLUMNA MESSIANIC RESEARCH CENTER: Nuclear Energy 1: IS NUCLEAR ENERGY A SOLUTION TO THE ENERGY AND CLIMATE CHANGE CRISES? Understand First The Secret Process of Nuclear Fission; and Its By-Products of Heat Energy, Radiation, and Radioactive Wastes. Nuclear Energy 1: IS NUCLEAR ENERGY A SOLUTION TO THE ENERGY AND CLIMATE CHANGE CRISES? Understand First The Secret Process of Nuclear Fission; and Its By-Products of Heat Energy, Radiation, and Radioactive Wastes. Current commercial nuclear reactors use nuclear fission to generate power. 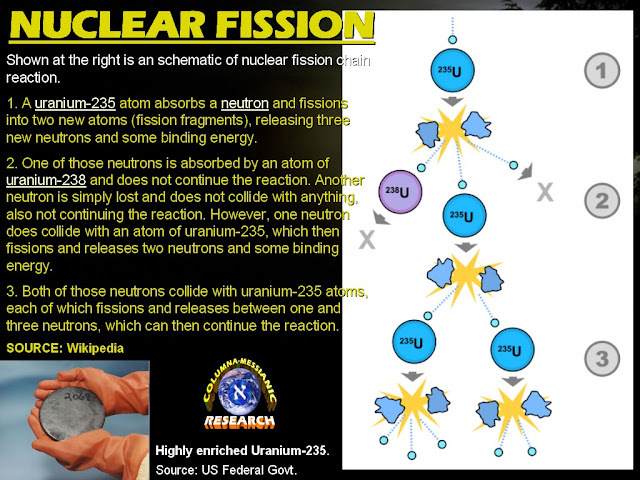 In nuclear fission, you get energy by splitting the nucleus of an atom using a neutron. In a conventional nuclear reactor, high-energy neutrons split heavy atoms of uranium, yielding enormous amount of heat energy, without producing carbon dioxide. According to the common knowledge Carbon dioxide (CO2) is the main cause of Global Warming. Thus, nuclear energy is looked upon as one solution to the worsening Global Warming/Climate Change crisis. But how safe, clean, and reliable is nuclear power? SECRET OF NUCLEAR FISSION: The INTERPLAY OF THE STRONG NUCLEAR FORCE, AND THE ELECTROMAGNETIC FORCE OF THE MATERIAL UNIVERSE! 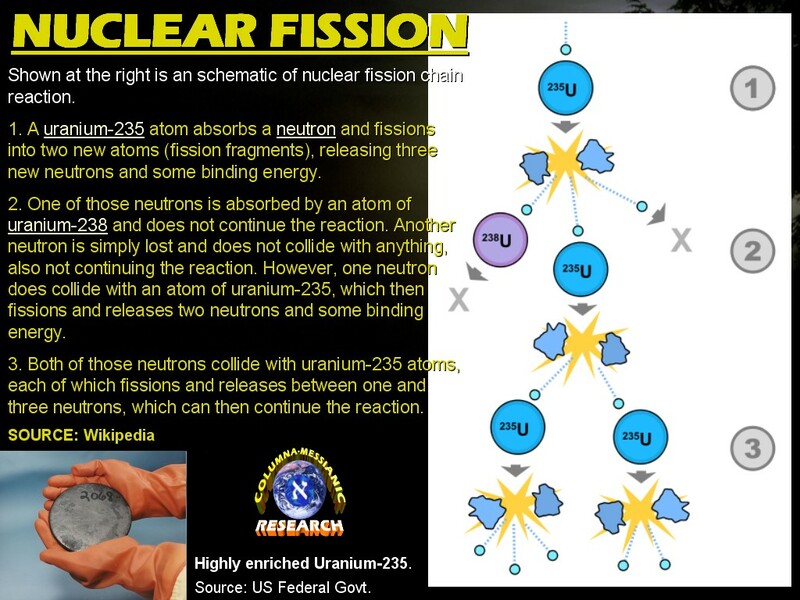 In FISSION TECHNOLOGY, the Strong Nuclear Force and the Electromagnetic Force are the predominant forces taking action. The Strong Nuclear Force is the force that holds together the protons and neutrons in the nucleus of an atom. The Electromagnetic Force is the force that makes particles with opposite electrical charges attract each other and particles with the same charge repel each other. This force ensures that the positively charged Protons in the nucleus of the atom and the negatively charged Electrons orbiting around it attract each other. This is the reason why the "nucleus" and the "electrons" of the atom, stay together. A nucleus that is too heavy to be stable can release energy by splitting it apart into pieces. Once the fissile nuclear fuel is bombarded by a neutron, it splits into two parts; and as soon as those two parts are more than about 1 fm (1 femtometre) = 1 × 10−15 meters) apart, the STRONG NUCLEAR FORCE no longer holds the two fragments together. The ELECTROMAGNETIC FORCE then takes over and accelerates them, causing them to gain a large amount of kinetic energy. This sudden release of kinetic energy transform a mass of the fissile nuclear fuel into an enormous amount of heat energy according to the famous formula of Albert Einstein. This nuclear heat energy powers Nuclear Power Plants and nuclear fission bombs. Thus, when a uranium fuel is bombarded by a neutron, it splits into several fragments and by-products, such as, enormous amount of heat, radiation, other elements, and free neutrons. These free neutrons also split other nearby fissile materials repeating the fission process. With sufficient nuclear fuel around, this process continues resulting to a self-sustaining fission process called "CHAIN REACTION." 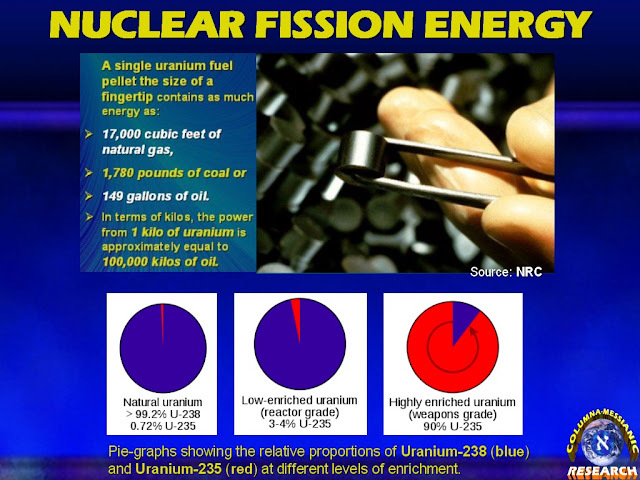 WHAT IS ENRICHED URANIUM NUCLEAR FUEL? Current nuclear reactors use the low-enriched uranium (3-4% U-235) as the fuel to produce nuclear fission and generate power. Nuclear Energy is very tempting to use in solving the Energy Crisis and Climate Change disasters because it does not use any Fossil Fuels (Coal, Oil, Gas, etc.) as compared to the common Thermal Power Plants using Fossil Fuels. The Nuclear Energy Release is done via the Nuclear Fission process of a fissile fuel (Uranium). This means no Combustion Process that produces CO2 (Carbon Dioxide). As explained previously, we get energy by splitting the nucleus of an atom using a neutron. In a conventional nuclear reactor, high-energy neutrons split heavy atoms of enriched uranium, yielding enormous amount of heat energy, without producing carbon dioxide. According to the common knowledge Carbon dioxide (CO2) is the main cause of Global Warming. On the other hand, Fossil Fuels produce smoke and other air pollutions, CO2 (Greenhouse Gas), oil spills, etc., which are all very damaging to the environment (air, land, and water). Also, the equivalent energy released by a nuclear fission is much more than the conventional fossil energy sources. Unfortunately, the fission nuclear process also produces the dreaded and unwanted by-products of nuclear radiation and radioactive wastes. The disposal, storage, and accidental or uncontrolled release of these by-products are very harmful to living things and the environment, even for generations to come. Continued on Part 2: IS TAPPING NUCLEAR FUSION TO PRODUCE ENERGY FOR ELECTRICITY AGAINST THE LAWS OF GOD? Yes, It is Against The Laws of God If Men Exclude God From This Technology of Heaven! Nuclear Energy Must Be Matched With the High Level of Morality, Not Just Engineering Ingenuity! I like the valuable innformation you provide in your articles. I'll bookmark your blog annd checkk again here regularly. I am quite cetain I'll learn many new stuff rioght here!